The IBM® SmartCloud Desktop Infrastructure offers robust, cost-effective, and manageable virtual desktop solutions for various clients, user types, and industry segments. These solutions can help increase business flexibility and staff productivity, reduce IT complexity, and simplify security and compliance. Based on a reference architecture approach, this infrastructure supports various hardware, software, and hypervisor platforms. IBM SmartCloud® Desktop Infrastructure with VMware Horizon View simplifies desktop and application management and increases security and control. Horizon View delivers a personalized, high-fidelity experience for users across sessions and devices. It also enables higher availability and agility of desktop services that are unmatched by traditional PCs, reducing the total cost of desktop ownership is reduced. Users can enjoy new levels of productivity and the freedom to access desktops from more devices and locations with IT greater policy control. 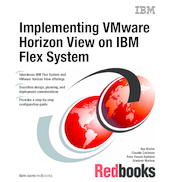 This IBM Redbooks® publication provides an overview of the SmartCloud Desktop Infrastructure solution that is based on VMware Horizon View that is running on IBM Flex System™. It highlights key components, architecture, and benefits of this solution. It also provides planning and deployment considerations and step-by-step instructions about how to perform specific tasks. This book is intended for IT professionals who are involved in planning, design, deployment, and management of the IBM SmartCloud Desktop Infrastructure that is built on IBM Flex System that is running VMware Horizon View.